Chestnut Ridge Cabins are located in beautiful Wears Valley, Tennessee between Pigeon Forge and Townsend, Tennessee, and next to the Great Smoky Mountains National Park. Plan to spend your next vacation in beautiful East Tennessee enjoying all the activities of Pigeon Forge, Gatlinburg, and Townsend. Your stay will be so relaxing at Chestnut Ridge Cabins. 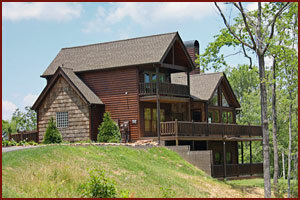 You may also consider staying in a nearby Sevierville cabin for your next vacation. Even a hotel in the Smoky Mountains would not be a bad choice for lodging. This spectacular luxury 4 BR, 4.5 BA newly constructed lodge is perfect for your next Pigeon Forge vacation. Amenities include an outdoor hot tub and fire pit, pool table, game table, free high speed wireless internet access, XBox 360 video game, 7 satellite televisions (2 are high-definition with a great selection of HD channels plus HBO), 5 DVD players, and a large selection of books, video games, board and card games, and movies. A fully equipped kitchen is available, along with an outdoor kitchen on the main deck with a Jenn-Air gas grill and refrigerator. All 4 full-size baths contain a whirlpool tub. A full-size washer and dryer are also available. Enjoy two wood-burning fireplaces (one located in the main level living area and one outside on the main deck). The main level of Pine Cone Lodge is handicap/wheelchair accessible. Pine Cone Lodge will sleep 2 to 14 people with 4 king beds, 2 sleeper sofas, and 2 twin bunk beds. It also has wrap around decks and covered porches, plus pavedroad access and plenty of parking. It rents for the following rates: Silver - $287.95, Blue - $302.95, Green - $327.95, Orange - $337.95, Purple - $367.95, Red - $387.95, and Gold - $475.95. For verbal reservations please call or send us an email for more information. THIS CABIN IS FOR SALE. Pigeon Forge and Gatlinburg have been family vacation destinations for many years. The Pigeon Forge area is a short drive from most of the eastern United States. Gatlinburg is the main entrance to the Great Smoky Mountains National Park which is the most visited national park in the country. The Smoky Mountains are home to a very diverse wildlife and plant life including deer, black bear, elk, rhododendron, poplar, and various species of oak. People come to the Smokies not only for the mountains, but also for the family entertainment in Pigeon forge and the quaint atmosphere in Gatlinburg, TN. Pigeon Forge has rides, putt-putt golf, go-carts, theater shows, outlet shopping, and much, much more for the entire family. Gatlinburg is home to Ripley's Aquarium of the Smokies and many fine retail shops. So the next time you spend a vacation in the Smoky Mountain area, stay with Chestnut Ridge rental cabins near Pigeon Forge. Another Smoky Mountain website by Stone Oak Web Design, Inc.